I had to post this. This is the new Marine Corps television ad I understand premiered during American Idol. Kudos to ad agency Hill and Knowlton. Great job. What an ad. Anyway, I know some former Marines look at this blog, so I thought I'd share in case you haven't seen it already on the television. Semper Fi. I was waiting somewhere yesterday when I picked up a copy of GQ Magazine to pass the time. Inside was an interview with presidential hopeful Mike Huckabee, in which he discussed his run for the presidency. 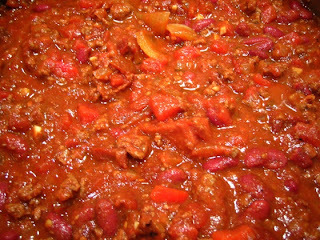 He made an interesting comment about cooking chili that made me think of my 2007. He was talking in another context, but I took something from it. He was asked to grade President Bill Clinton's and President George W. Bush's time in office. In essence, he answered that we really couldn't make a judgement about a president's job performance until years after they left office because, like cooking chili, it's often a lot better after a few days. I started revisting 2007 in my mind. That's how I choose to look at last year. We're making chili. In some ways, last year was very challenging for me. There were some great times and good memories, but for the most part 2007 was what people of faith call a valley experience. These times have a purpose, and their effects on us are always better later. I have a feeling a few years from now I'll look back on 2007 and see it as one of the most important and productive years of my life in many ways. I heard someone on TV yesterday say that 2007 was a year when not much went right. If that's the way you feel today, I encourage you to look at what God may have done in you during that time. Those challenging seasons of our life usually don't seem as beneficial until we have the benefit of hindsight, but that doesn't mean they aren't greatly beneficial. I learned a lot last year and can take those things into what I am sure will turn out to be an exciting 2008. I certainly hope so! I've been blogging for just over two years about my journey. You'd have to think we're getting close, woman of God! Here's wishing all of you the very, very best in 2008! Happy New Year!